Anne-Marie Culhane creates events, performances and long term projects that invite people into an active and inquiring relationship with each other and the earth. She works as artist, activist and collaborator across a range of disciplines. Culhane conceived of Earthwalking through an Exeter Enquires residency co-ordinated by Arts & Culture at the University of Exeter funded by Arts Council England. The residency enable Culhane to develop a working relationship with Tim Lenton, Professor of Climate Change and Earth System Science, Dr. Luke Mander and Tom Powell, researchers in Earth System Science at University of Exeter. 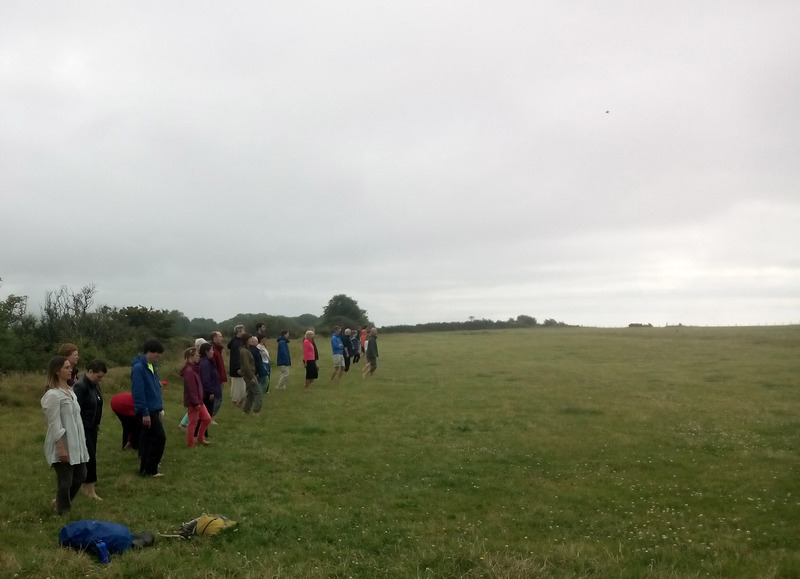 Earthwalking was a two day ‘choreographed journey’ with overnight camping along 10 miles of coastline in Devon, from Beer to Sidmouth, that aimed to honour different ways of knowing and experiencing the world, offering different perspectives on land, sea and change. 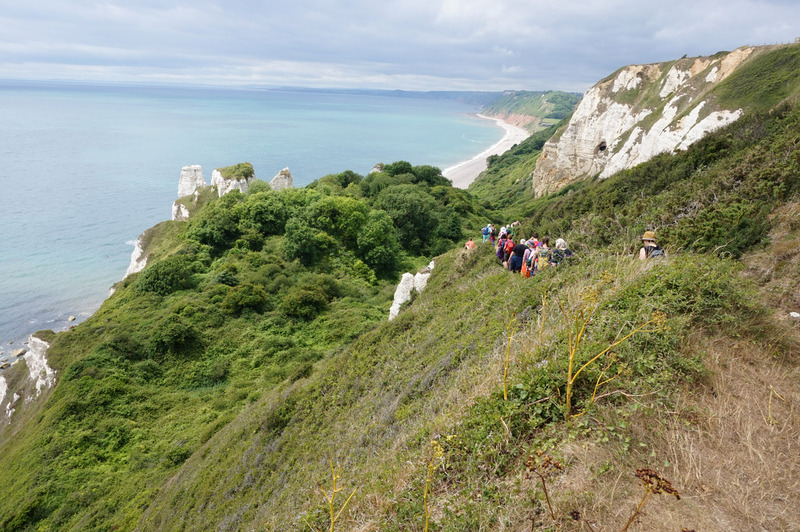 Earthwalking involved 33 participants from a range of backgrounds (scientists. artists, curators, administrators, auditors, researchers, playwright, writers, bird watchers) with ages up to the eldest at 75 years old. Twenty-one of these responded to a public invitation to take part. 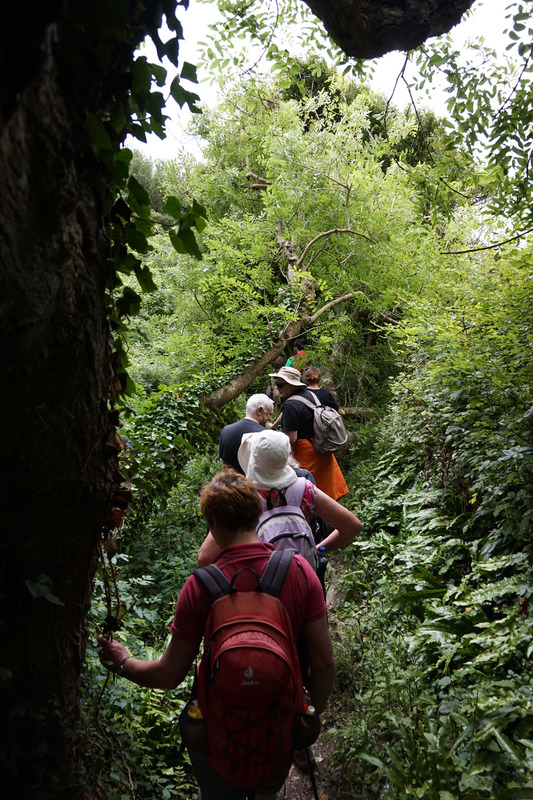 Earthwalking aimed to bring something of the feeling of the wilder edge of our land – and a wider sense of community – into our conscious reflection on how we live and act in these times. The idea of a walk was seeded in an early conversation in the residency. A common thread in all our life stories was that playing, exploring or walking in the landscape was a key motivation for inspiring us with the passion for the work that we do. Looking around the Earth System office, on the 7th floor of an overheated concrete building in the city, I realized how far removed we all were from the places that nourish and inspire us. I located our continuing discussions out on campus, on the coast, or in the little shed at the Exeter Community Garden, observing the subtle shifts in how we communicated in different contexts. In particular, walking outdoors changed the rhythm of conversation, other elements (weather, terrain, observations) together with silence and pauses become an integral part of the exchange. There was more ground for possibility. My impulse was to continue these inspiring conversations and to share the questions emerging with others in an outdoor, journey setting. The Jurassic Coast is close to Exeter. It offers a frontline, where stories of change are played out almost in double-time on the crumbling and lively island edge. The land is constantly slipping and eroding and yet the exposed rocks here draw us backwards into the story of the planet, into deep time over many millions of years. I wanted to demonstrate that you don’t need to travel to the ends of the earth to bear witness to the changing climate. Tim’s work is deeply influenced by his relationship with James Lovelock and the Gaia Theory, which offers a story of the world as a self-regulating, evolving complex system. There have been many people, past and present, inhabiting this coastline (including James Lovelock) and it felt important that some of these people and their stories be part of Earthwalking. Our bodies, the earth, this place. 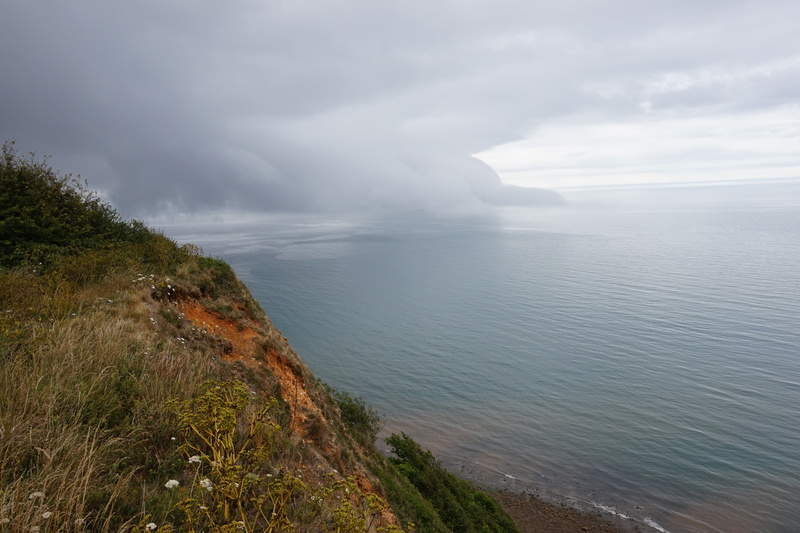 I invited people to walk in silence down a steep path through the Hooken Undercliff, a 10-acre area of land that, one night in March 1790, slipped away from the high chalk cliffs towards the sea. Fishermen reported coming out and finding their crab pots above sea level, as the scale of the slump caused a reef to push up out at sea. There is something unique about walking through this new land – a green oasis with its birdsong, weave of plants and trees, sheltered by chalk pinnacles. Dr Ceri Lewis, a marine biologist met us at the shoreline and enthused about her love for the small soft and shelled creatures of the sea that she had gathered from the rock pools. She explained the plight of their calcium shells in an acidifying ocean, and her work to protect these marine invertebrates from marine pollution and climate change. We do simple experiments, blowing down straws into coloured seawater to see our breaths change the ph. At moments throughout the day, we hear from Dr Luke Mander who shared spontaneous geological observations, as we walked West back through time. Chris Woodruff, an East Devon Area of Outstanding Natural Beauty land manager relayed stories of complexity, change and human conflict catalysed by the contradiction at the heart of his work – conserving the natural beauty of a place made remarkable by its dynamic nature. Goonlas, a Cornish sea song started our evening session. 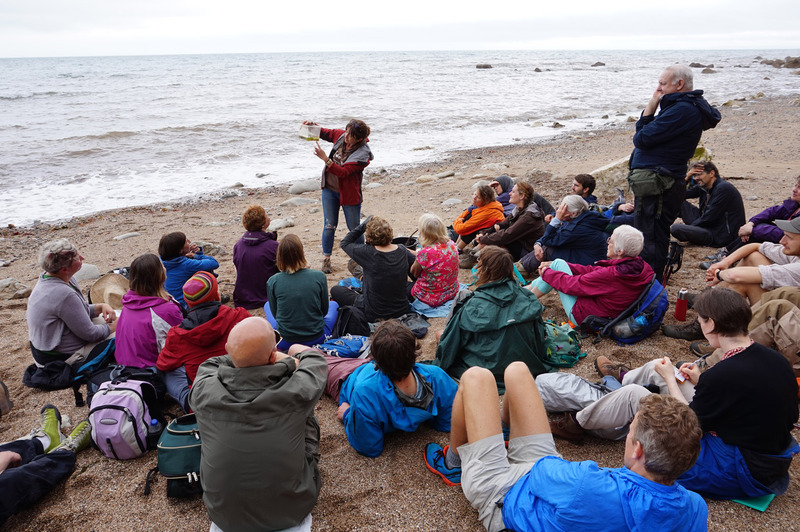 This is an adaptation from the ongoing Storm Songs project by Natalia Eernstman, initiated earlier in the year with people from Porthleven in Cornwall, creating new verses and sea songs with communities, to mark our changing relationship to the sea. 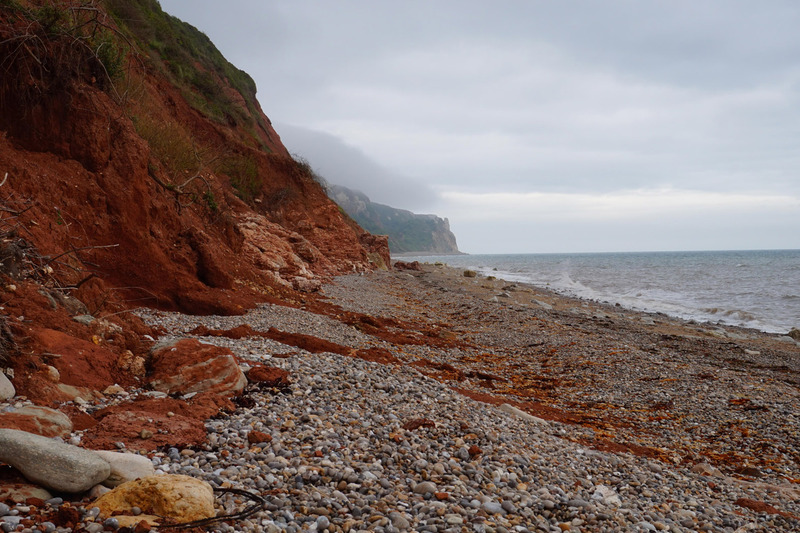 For Earthwalking a new English verse was created using words from local accounts of the Branscombe storm of 2014. Branscombe is one of the places where tensions over whether to rebuild or retreat from the incoming sea are playing out. 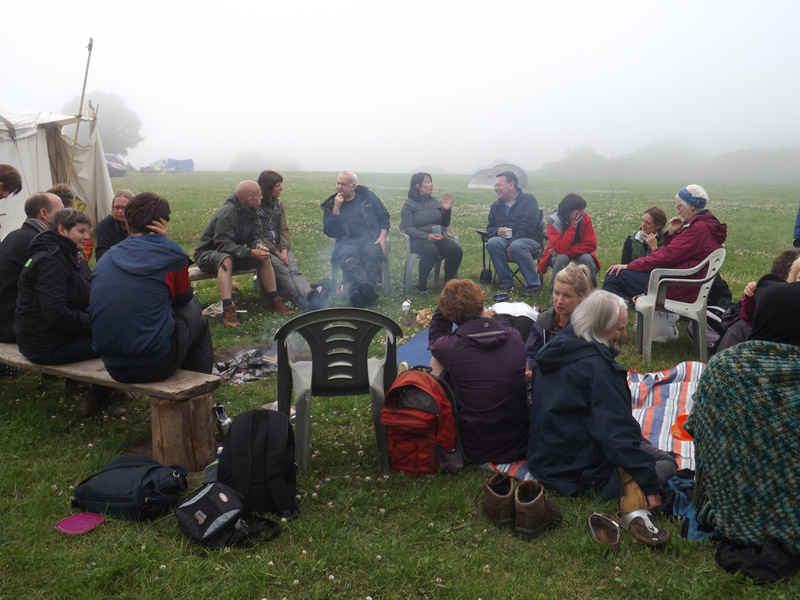 The song was followed by a space where the walkers themselves brought their varied and insightful reflections, questions, ideas, song, dance and poetry to share with the group around the fire. I opened the morning walk by leading a Field Sensing session. This involves slowing down our movements in order to sense inner and outer landscapes more acutely. I chose to locate the Field Sensing at Berry Fort, the site of a Neolithic coastal settlement and Iron Age Fort. At Weston Plats, Tom Powell, a food systems specialist selected extracts from aural histories of coastal cliff farmers collected by the Branscombe Project, to illustrate the growing cycles of the ‘plat’ farmers, who farmed these sheltered, marginal edgelands over centuries until the 1960s. He scaled this up, to share reflections on today’s global challenges of food, population and our massive harvesting of biomass. Huddled in a renovated stone byre, small groups of walkers listen to artist and local smallholder Laura Williams recounting a moving personal story of resilience and adaptation. Her land, in a valley close to the coast, had slipped in 2012, covering the area earmarked for their house and causing the release of shoals of farmed carp away from their land down the valley and into the sea. After a further two hours walking including an unrelenting final ascent and a spontaneous dip in the sea, our journey ended at the Old Dissenters Meeting Hall in Sidmouth with its inspiring history of activism (in particular Annie Leigh Brown a suffragist from the age of 17). We were greeted warmly by members of the Vision Group for Sidmouth, a collection of local sustainability campaigners eager to exchange ideas with the walkers and to share the successes and challenges of working in their community and drawing us back into the wider sense of community and action. The experience was transformational and gave me a totally altered sense of community, the landscape and the future of both. (Participant). Earth system considerations call for some rethinking of economics and a wider social discussion about what kind of future we want, which will engage the arts and the humanities as well as the social sciences. I’d like to acknowledge my gratitude to Jo Salter and Emily Williams (Kaleider) and to Fern Smith and Lucy Neal, who have advised on Earthwalking. This blog also includes extracts from an interview with Kaleider. Anne-Marie’s passion for bringing together different disciplines and perspectives on place started with a self-initiated residency on Arthur’s Seat, Edinburgh in 2001-2002 funded by Scottish Natural Heritage, Historic Scotland and the Millenium Commission. Further Projects include Abundance (co-created with Stephen Watts), winner of Observer Ethical Award Grassroots Category, 2010 and Fruit Routes/Eat Your Campus working with the School of the Arts & the Sustainability Unit at Loughborough University, winner Guardian University Awards Sustainable Project 2014. She has worked with National Trust, Tamar Valley AONB, Exmoor National Park, ArtsAdmin and exhibited at Bluecoat, Liverpool; National Media Museum (with Ruth Levene); Newlyn Gallery, Penzance; Castlefield Gallery, Manchester and Plymouth Art Centre and co-founded of Out of the Blue, Edinburgh. She is an associate artist with Encounters Arts and Kaleider and recently completed a commission for CCANW (Soil Cultures Residency). This Autumn she is starting a year long participatory project A Field of Wheat with artist Ruth Levene and farmer Peter Lundgren which explores collective ownership, industrial what farming and local & global food systems. There is still time to be part of this, follow this link for more information. Anne Douglas, during her Mcgeorge Fellowship at the University of Melbourne, Australia, visited with Lyndal Jones and The Avoca Project in Avoca, Victoria. 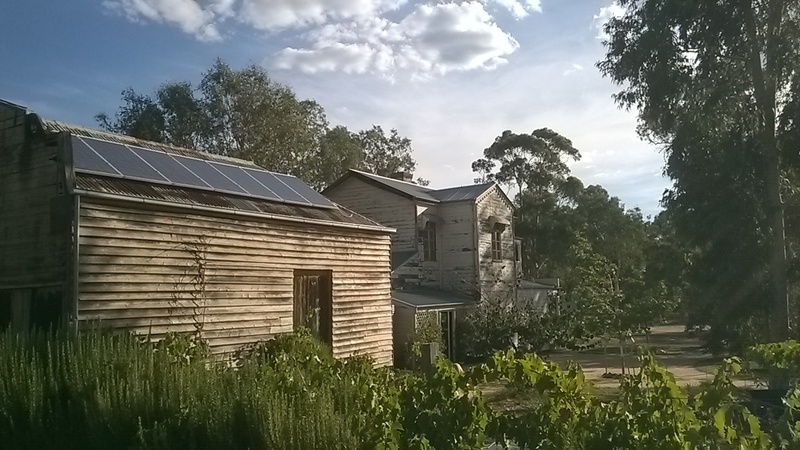 In this guest blog she highlights some of the ways in which Lyndal and her collaborators have been demonstrating an art of sustainability, through a house and a garden. The Avoca Project draws together art, place and climate change in a unique configuration. Nine years ago, Lyndal Jones, one of Australia’s most renowned artists, funded the purchase of a derelict house in Avoca, a rural town in the State of Victoria, Australia. The Avoca Project became a ten year commitment (2005-2015) to environmental issues and something of a counterpoint to the form and practice of international art biennales. It would inspire future work as an engagement between art and the public in relation to climate change and challenge the idea of place as physically stable. 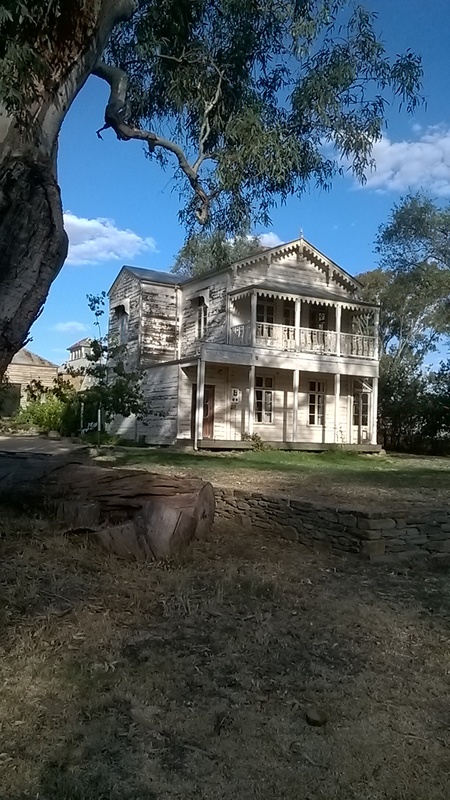 The house is an early example of a two storey timber framed prefabrication of Swedish design, found in Australia in the 19th century among the middle classes during the period of the gold rush (1851 –late 1860s). The kit was imported from Germany as numbered planks and costructed as accommodation for one of the hotels in the town. This was a period that trebled the population of European and Chinese immigrants in the area. In 1852 the house was moved, in order to enlarge the hotel. It had been situated higher up the hill on the main street and was beautifully re-sited to overlook the Avoca river. What makes a house an artwork? There is a conceptual simplicity to this work that belies deep complexity. First and foremost there is a particular intelligence and sensitivity towards the building as a place to inhabit in 21st century, based on an awareness of the impacts of industrialisation on the social, cultural and environmental. Once a dwelling of grandeur, the house had suffered from the harshness of climate and decreasing wealth in the rural areas. In response to these issues, the project embodies an openness to questioning current modes of living and increasing awareness of actions that we can usefully take to create more sustainable living environments. This is perhaps best explained in an example: the house was flooded in 2010. This event ironically took place three weeks after the production of a performance piece, Rehearsing Catastrophe: the Ark in Avoca (described below). Jones’ work in repairing the house had included making it ‘flood friendly’ in response to hearing it was on a ‘1 in 100 year’ floodplain (with use of rugs rather than carpets, solid wood rather than chipboard, few whitegoods…). The waters may now enter in and exit out of the property, with only minimum damage. This approach to living ‘with’ rather than ‘against’ nature is an ethos, a way of being, that underpins the most simple actions in everyday life in this place. Important to the quality of this work as art is the way Jones conceptualises her role as ‘custodian’ and ‘restorer,’ as opposed to ‘owner’. An owner would perhaps renovate by drawing the house into his/her taste and life style. As custodian, Jones mediates the past, present and future of dwelling, judging what is appropriate and inappropriate intervention. The house has been re-roofed, re-plastered, re-wired and re-glazed using found timber to render it fit to live in but more than that, a beautiful place to inhabit ethically. Much of the work is Jones’ own labour, assisted by volunteers, and undertaken at weekends and free personal time. Guests are invited to participate at their own pace but never onerously, contributing to an ongoing performance of sculpting a ruin back into existence. Beneath this careful restoration of the traditional infrastructure lies a particular sensitivity to energy and water resulting in a quite different, parallel infrastructure from the historical fabric. Focused decisions have emerged out of a process of trial and error, a process of intense learning about which technologies to use and which to avoid, in developing a light ecological foot print. This second infrastructure constructs a series of virtuous circles between availability and usage of natural resources. Within the garden under the lawn is constructed a water tank that can contain up to 90,000 litres of water. The tank consists of an underground trough lined with a geotextile, a rubber membrane, into which are inserted a series of plastic crates which provide a shape through which the water flows. The trough is filled with water. Local water is high in salt and requires to be desalinated so this storage of rainwater provides an important alternative. Heating is provided through a slow combustion stove using timber from the property and the underground water tank within a closed water system. Visitors are aware of water usage in part through the subtle visibility of the water gauge close to one of the main entrances to the house and also through encouragement to collect excess domestic water where possible to sustain the prolific plant life of the site, including a kitchen garden walled by rosemary bushes. In this way we are gently persuaded that ‘living well’ means ‘living ethically’ through intimate daily habits working with the available resources, mindfully. In the same way the photovoltaic cells on the roof of one of the outbuildings act simultaneously as a functional and as a visual and symbolic reminder of how energy is acquired and used. 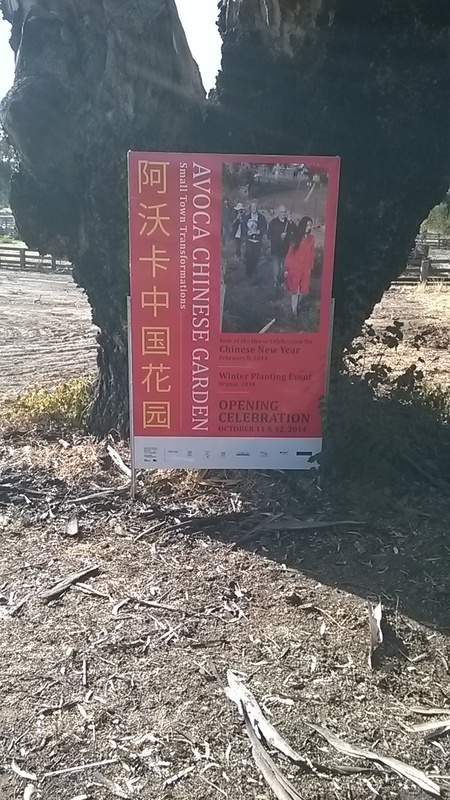 In April 2014, the community of Avoca will witness the planting of a Chinese Garden. The Chinese Garden at Avoca has been developed by three artists: Lindy Lee (a Sydney based Chinese-Australian artist currently developing a Chinese Garden in Sydney in parallel with Avoca) is lead artist; Mel Ogden (a landscape artist and expert in stone, who designed and laid out the gardens of The Avoca Project) is Designer and Project Manager; and Lyndal Jones as Artistic Director. These artists are working in collaboration with a formally constituted Committee that represents the different interest groups that the project has catalysed. The idea of building a Chinese Garden emerged through a number of discussions and gathered traction as a concept. The Chinese community had been very present in the period of the Gold Rush and the chosen site was close to the original Chinese graveyard. The privately owned site, adjacent to the house and also on the flood plain of the river, has been negotiated across private/public interests with a long lease under the condition that the community undertakes long term maintenance of the garden as an artwork. The nature of the task is detailed as part of the contract. It is important to note the artist-led nature of this development. Although funded through a national cultural tourism initiative, requiring significant organisational experience, this project has emerged from the arts community rather than business, offering confidence and a model for future community focused projects. The insistence on the garden as an artwork instils very high production values led by experienced professionals. The site runs from east (high ground) to west (low ground) with the river running south to north and will deploy a number of aesthetic/ecological tactics that have been tested in The Avoca Project. Chinese gardens are traditionally constructed around four elements including pavilions, water, rocks and plantings representing the seasons of the year. This garden will feature such elements interpreted through current material modalities and their potential for new meaning across the past, present and future, significantly acknowledging an inter-cultural dynamic. Underpinning the whole is a strong ecological thread. The site, in particular its water, is developed with the same technologies of an underground storage system that here cleans the town’s water using plants and the crate system used for The Avoca Project. It is also based on sensitive plantings that can accept local soil conditions, such as River Red Gums, and developed through seasonal and aesthetic judgements. Significant to the whole development is a series of events, effectively new rituals that mark each stage of development in relation to seasonal changes. The starting moment on site was in October 2013 – a procession to the site by children with lanterns they had made, where they met Lindy Lee. Chinese New Year at the beginning of February was marked with a Chinese Dragon. Winter planting will follow the installation of the main infrastructure in late April and the official opening in October 2014. This sense of ritual will continue into the way the site will be open for use for public events. The Avoca Project is contributing a tea ceremony that intermingles the Chinese Tea Ceremony with the more implicit rituals of tea drinking within Australian culture as a means of coming to terms with any important or social moment. The aim is for the garden to be able to host tea ceremonies that draw on the visuality and materiality of one culture in order to throw light on another in a small town where a history that had become hidden – its Chinese history – might provide a means for the town to prosper in the future with the envisaged pilgrimages of Chinese tourists to the area. The Avoca Project reverses and questions many of the tropes of how we expect to live. It is simultaneously a public and a private project, owned and shared. Individuals – artists from outside of Avoca and members of the Avoca community – are invited to engage in the project in different ways. The point is to be influenced by its histories, its current values and reasons for being and to be creatively challenged to make sense of this encounter as a responsive and responsible individual. Those who choose to participate are invited in to imagine, to reflect, to make new work, to talk and exchange experiences and thoughts. The undoubted courage, stamina and joy of such a commitment is frequently tested in an emotional and personal grappling with the distance between environmental sustainability and practices of land ownership, between expectations of art and issues of everyday life. It is important to remember that the Avoca house was described as ‘beyond repair’ at the point of purchase. “Beyond repair’ acts as a metaphor for the way climate change is publicly imagined. By implication, it is ‘beyond hope’. This metaphor takes us to the core of the Avoca project as artwork. Framing acts of repair in relation to everyday life, the project becomes a means to grasp the ‘beyond hope’ and confront its implications. Jones describes this as ‘rehearsing catastrophe’. It is at once a metaphor and an artistic and performative strategy. Rehearsing catastrophe is an imaginary that underpins a number of Jones’ works within a series led by Jones with other artists, Propositions for an Uncertain Future. Each piece leads participation through a strong conceptual frame that focuses the circumstances of potential disaster. The Ark of 2012, for example, focused the requirement to leave the land as a consequence of flooding, marshalling pairs of species (participants in masks) resonant of Noah’s Ark (see video here). Poignantly each participant was allowed one suitcase. The project powerfully evokes experiences of forced migration, of boat people, of evacuees from a war zone, of competing for resources and of being forced to encroach on other people’s land through sudden retreat from one’s own. The projects ‘name grief and loss’ (Lyndal Jones in conversation 12.3.2014). If we think of The Avoca Project as an encounter in and through art, we might see that it is unforeseen in the way that art in normally produced. It is neither forced through the kind of shared thematic that frequently underpins public commissions nor is it easily categorised as emerging from a ‘social’, ‘situational’ or ‘relational’ genre of practice. The project is volunteered, not predetermined. It emerges out of a kind of exploratory questioning in which each new discovery accumulates knowledge. The necessity to classify falls away because of the clarity of the work as art in the form of a lasting encounter in which one insight and action builds upon another in the construction of a new world. In the meantime Rehearsing Catastrophe: The Ark will be reimagined in Mons, Belgium in June 2015 as part of its fesitval as 2015 Cultural Capital of Europe. The themes were land, walls, boundaries – plus John Muir and China. The first venue for a day of walk and talk was the Ecology Centre near Burntisland, with its impressive blend of social and ecological engagement. Ronnie Mackie and Julie Samuel explained how determination had made the place happen, by nurturing volunteer contributions and generating community input. 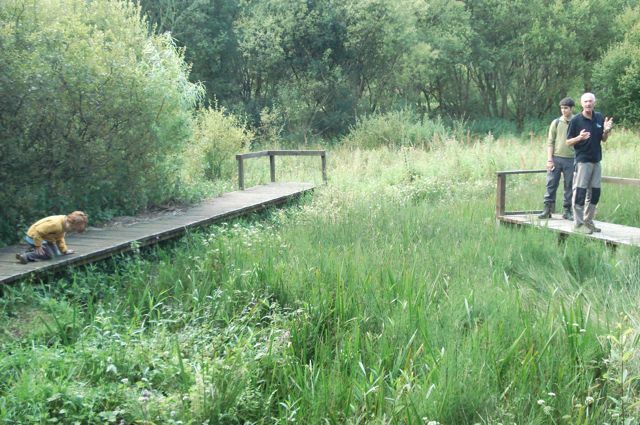 Biodiversity is catered for too, with this wetland created from a former industrial dump. We found toads, well-tended poly-tunnels, allotments and more. John Muir was the main topic of afternoon talks, being introduced by Liz Adamson of Polarcap and Jo Moulin in the afternoon of talks – Muir’s birthplace in Dunbar is a visitor centre that contributes to sustainable living in East Lothian. The group mulled over the Muir quote: “I went out for a walk and stayed out till sundown, for going out I found I was really going in.” Wild development was an idea presented in another form in scenes of contemporary China presented by Peter Lindow. On the wet 10th, we convened at Falkland Centre for Stewardship. The day was introduced by Ninian Stuart and Tess Darwin with a tour of woodland walks and farmland – following boundaries and learning (indoors) how the estate has become a place to learn to live more sustainably, threading traditions of stewardship with community involvement and ecological design. The Centre extends support to artwork such as Resounding – sound installation including work by Louise K Wilson – and also to a new conservation project – Lomond Living Landscapes. The latter was presented by David Munro, describing how the ‘commonty‘ of the hills (currently dissected by the Fife/Perth boundary) had been successively divided and enclosed, with ‘marches’ and ‘meiths’ [boundaries] surviving. How can art/craft and biodiversity link? This was a themes developed by Reheema White, lecturer in Sustainable Development at St Andrews. Her presentation made no bones about the implications of species loss and unsustainable lifestyles, but allowed for a creative engagement. This allowed me to explain why I value ecoartscotland as a network, seeing ‘ecoart’ as linking different kinds of knowledge and moving ourselves outwith comfort zones. A theme emerged: what would John Muir take into account if he were alive now? One response was that having taken Teddy Roosevelt to the Yosemite, he might take Alex Salmond to Menie Links in Aberdeenshire (the Trump development). A stimulating event of exchanges, with no particular outcome required but things brewing.